Since 1982, it's the Great American Beer Festival! 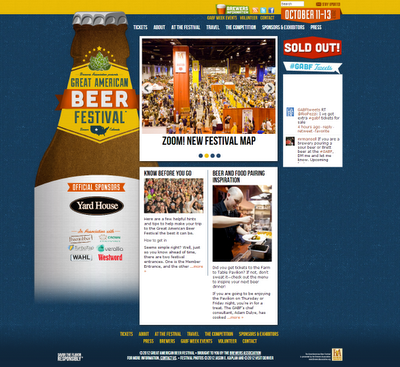 Today through Saturday, it's the 31st Great American Beer Festival, held, as it has since the first in 1982, in Denver, Colorado, organized by the Brewers Association, the advocacy group for small breweries in the U.S.(that is, producing fewer than 6 million barrels * of beer a year). 50,000 attendees, assisted by 2,800 volunteers, will have the opportunity to taste from among 2,700 beers from 578 breweries. 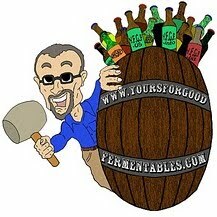 Live streaming, live audio, and videos at the Brewing Network: here. 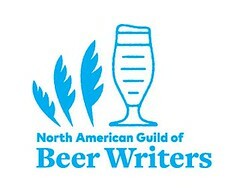 The GABF invites industry professionals to sit together in small groups and, without knowing the brand or brewery name, evaluate beers in defined style categories. The ultimate goal of the GABF Judge Panel is to identify up to three world class beers that best represent each beer-style category as described and adopted by the GABF. Awards will be announced Saturday beginning at 10:30am MT (12:30pm ET). Gold, silver, and bronze will be awarded for each of the 84 categories. Awards for breweries-of-the-Year will be announced, based upon production size, brewery or brewpub, and number of medals garnered. Read an interview with Julia Herz, Craft Beer Program Director at the Brewers Association, discussing the festival and the state of the 'craft beer' industry: here. * A beer barrel is not an actual thing; it's a measure of liquid volume. For beer, that's 31 gallons, which breweries often translate into a commodity metric: CEs or case equivalents. A barrel is the equivalent of 13.7 CEs. Thus, six million barrels is the equivalent of eighty-two million, two-hundred thousand case equivalents. That's a lot of beer. DMV breweries: Sandy, you're no derecho. After 79 years: Washington, D.C., no longer last. In October, make it a Virginia wine. Cosmic! A Cask Convergence in Falls Church, Va.